Where you can buy a permit? Road Registered Vehicles, 4WD’s, Motor Bikes,Commercial Buses, No Trailers, No Horses, No Pedestrians, No Conditionally Registered Vehicles, No Unregistered Vehicles Permitted. 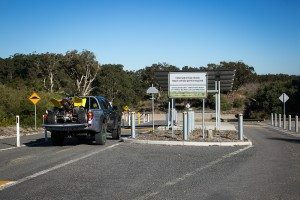 Road Registered Vehicles,4WD’s,Motor Bikes, Commercial Buses, Trailers, Conditionally Registered Quad Bikes and Motor Bikes, Horses, Pedestrians, No Unregistered Vehicles Permitted. Road Registered Vehicles,4WD’s,Motor Bikes, Commercial Buses, Trailers without Conditionally Registered vehicles, Horses, Pedestrians, No Conditionally Registered Vehicles Permitted, No Unregistered Vehicles Permitted. Engage your vehicle into the 4WD mode. The biggest issue on sand is the lack of floatation. 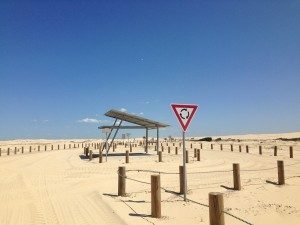 If you pump your tyres up to 50 PSI and try to drive along the beach, your 4WD will sink on 99% of Australia’s beaches. Try it again though at 16 PSI, and you will have a pretty good chance. This is the tyre pressure I recommend for most 4WD’s on sand. If its soft, don’t be afraid to let the tyres down even more. Drive in others tracks, it’s somewhere that a vehicle has been before safely. 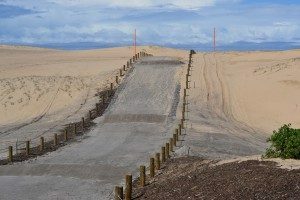 Existing tracks along the beach front may help you find the safest and easiest driving route, and also gives pedestrians an idea of where vehicles are going to be. Slow down, especially around other cars, and look out for pedestrians. Both sea and tidal conditions play a part in safe beach driving. High tides have differing levels dependant upon the moon phase, study the tide chart to identify high tides above 1.8m plus which I consider a big high. Big high tides together with large swell form dangerous driving conditions. The push from the swell will cover most of the driving surface in many places on the Birbui end of the beach, so be mindful. Under High tide conditions it is recommended that you drive at the back of the beach against the foot of the vegetation area. Driving on low tide offers more options, the sand is harder closer to the waters edge and makes driving a lot easier and safer. Avoid sharp turns and sudden braking. Please be mindful of the changing conditions and of other park users around you and stay safe. Fenwick’s Towing (Ph 02 4952 9544) is licensed to operate on the park and may be able to provide assistance to bogged vehicles (fees apply).